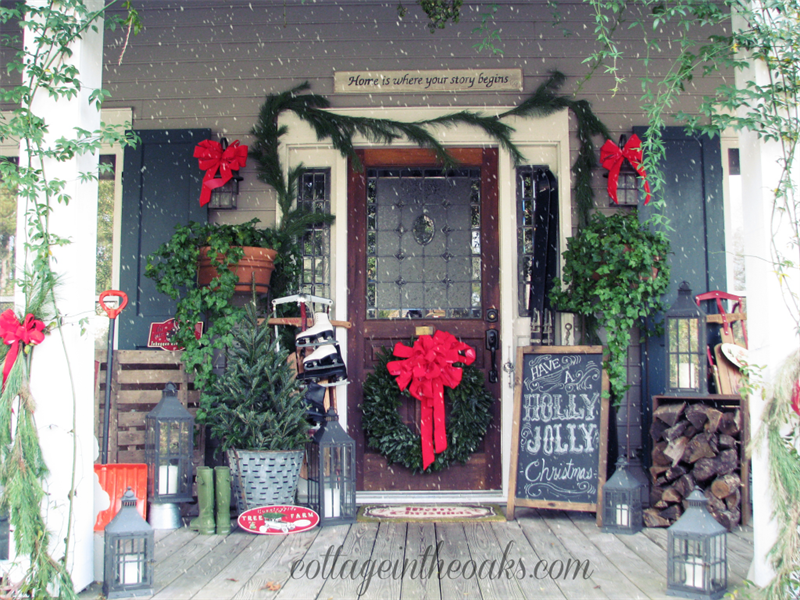 If you haven’t decorated your home for Christmas yet, it’s not too late. Bringing in some of that Christmas spirit doesn’t have to be expensive or time-consuming, and we’re here to prove it. Welcome to the 12 Days of Christmas Decorations. The thought of hanging up lights all over the house (and don’t even talk about the outside of the house) is exhausting. 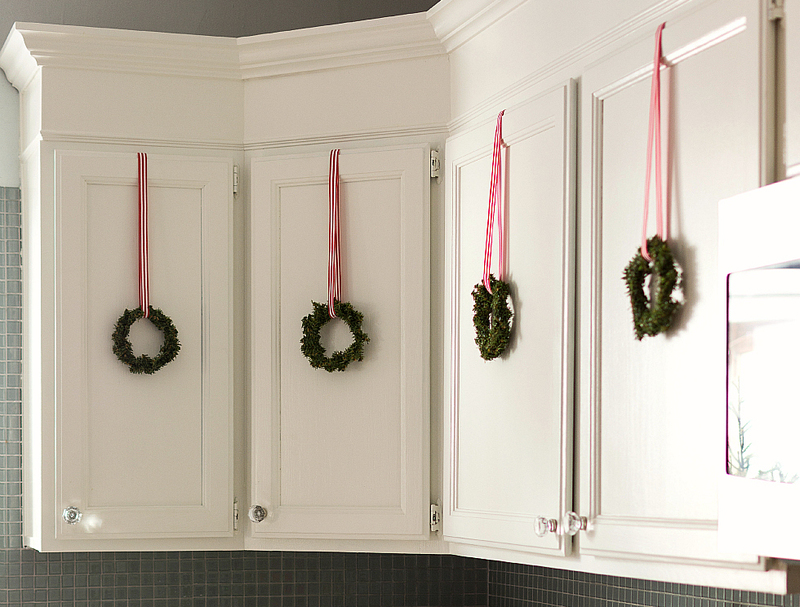 That’s why we love the idea of mini-wreaths. 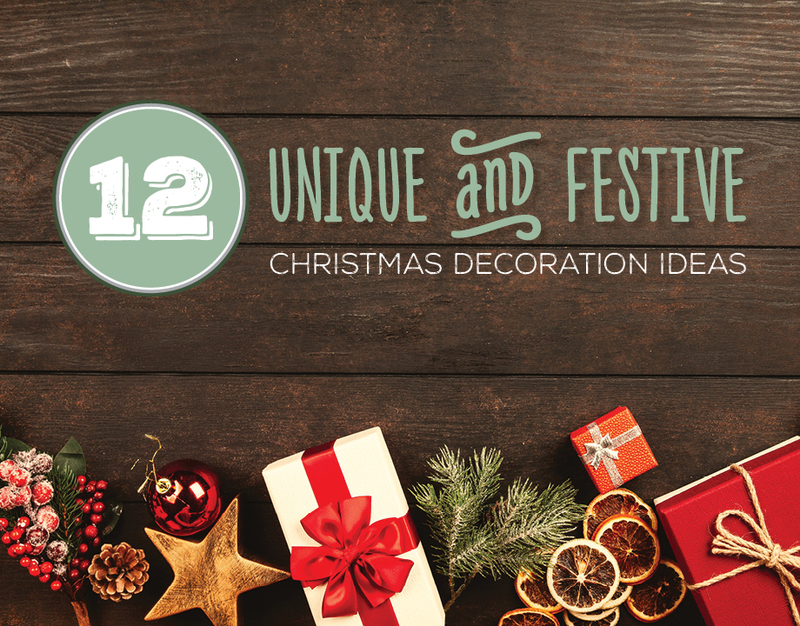 They’re easy to decorate with, and they instantly give a room that Christmassy touch. You can get mini-wreaths at a variety of places including Macy’s, Target, Bed Bath & Beyond, and Etsy, but perhaps the easiest option would be (you knew this was coming) Amazon. Perhaps one of the best parts about these mini-wreaths? They’re easy to store. No massive attic space needed. 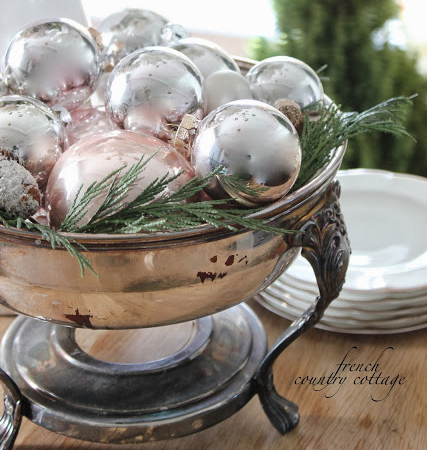 One of the biggest challenges when it comes to decorating for the holidays is finding good places to set things. Seriously. I mean, you have the mantle (if you have a fireplace), bookshelves, and maybe you have a side table or two. But let’s face it – there’s only so much decorating real estate available! 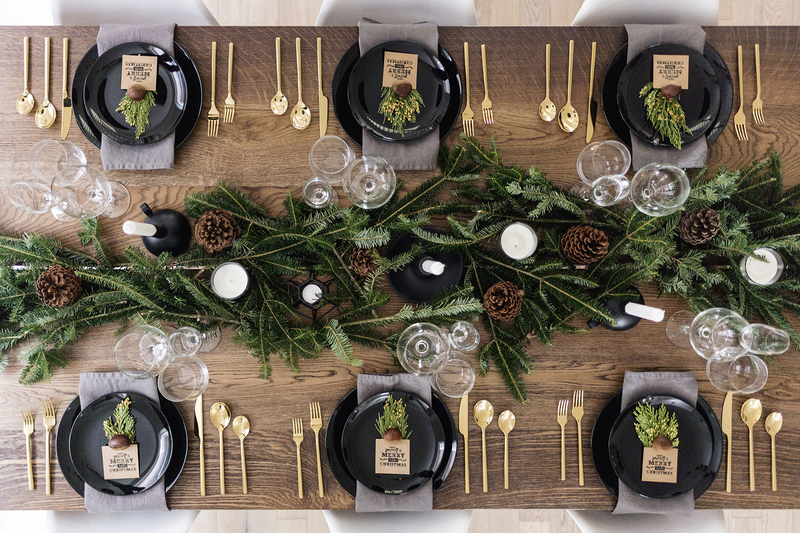 That’s why setting the table with some festive pieces can make such an impact. 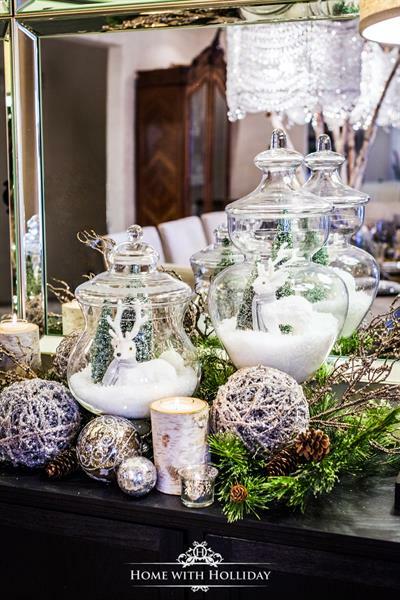 The beauty of this is that you don’t have to do every little thing – just a few simple swaps to your regular table setting can give your entire room a Christmas facelift. If you live in a woodsy area, creating a centerpiece like this one could be as easy as picking up some pinecones and grabbing a few pine branches! Whether you’re a real or fake garland person, we can all come to a conclusion here: garland instantly makes a room feel like Christmas. Garland looks great around door frames, window frames, across the mantle, above your kitchen cabinets, down the staircase, around mirrors, on side tables or the dinner table, framing bookcases… shall we go on? If you don’t want to mess with festive knick-knacks all over your home, garland is a simple way to spread some widespread cheer. Plus, thanks to Command strips, getting them hooked up is really easy. It’s always better to have more ornaments than not enough, but what do you with the leftovers? Easy! Create a centerpiece. To add a little extra oomph, add some snippets from your Christmas tree. 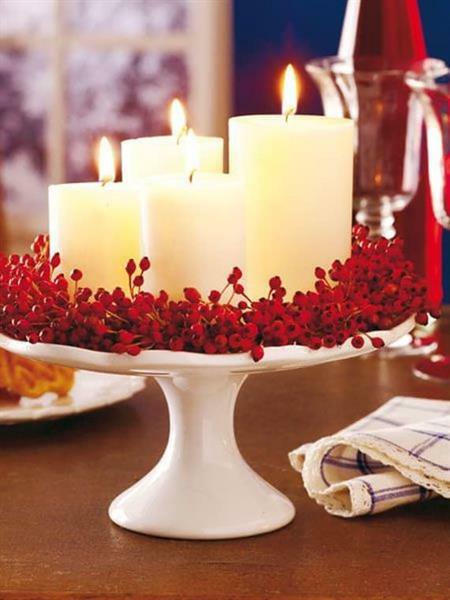 If you have any cake stands, adding some candles or Christmas accents can create a beautiful centerpiece. The best part about this Christmas decoration idea is that you probably have some things around the house that would do the trick. Pretty Providence shows this unique decoration idea in their Thanksgiving table ideas, which makes this design even better – double holiday duty! 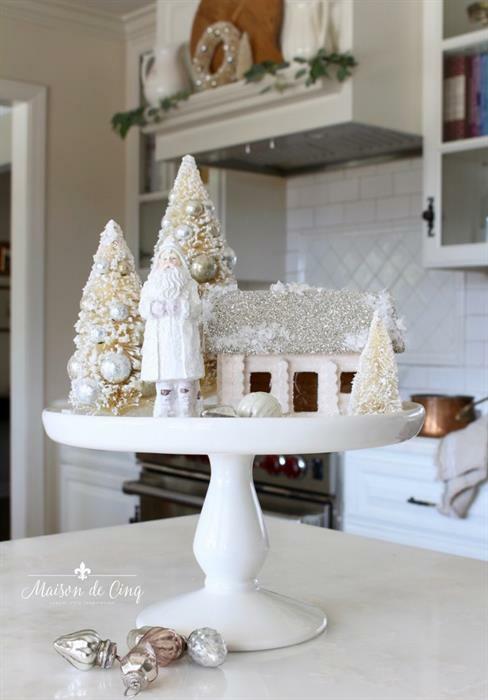 Some alternative inspiration comes from Maison de Cinq, which shows a cake stand with some small Christmas knick-knacks like trees, a Santa, and a frosty house. 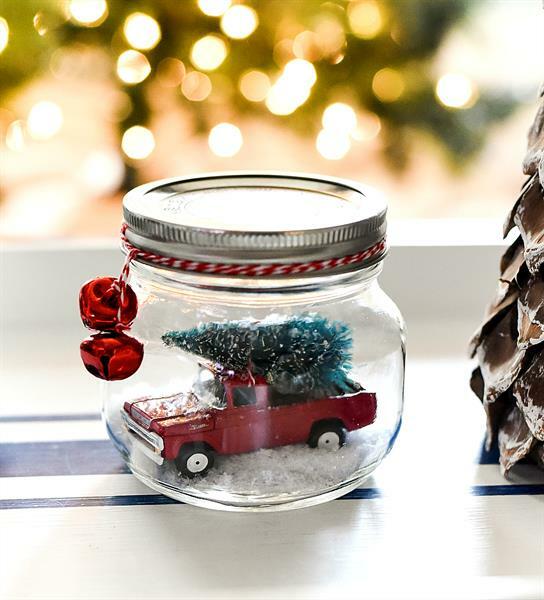 It’s easy to turn a simple jar into a unique Christmas decoration by adding a little snow and a prop or nativity piece. You can buy faux snow at places like Target, Amazon, or Michaels. You can also find some unique jars and glass containers from a place like Hobby Lobby. What’s fun about this idea is that you can be as creative or as basic as you want. Use something as simple as a mason jar, or pick up something as nice as apothecary jars. Add in some snow, and top it with whatever decorations you have on hand. 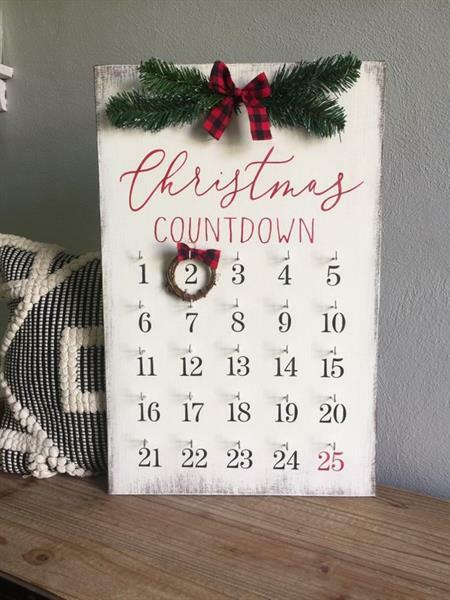 Not that everyone has extra wood laying around, but if you do, it’s really easy to whip up a festive wood Christmas sign. 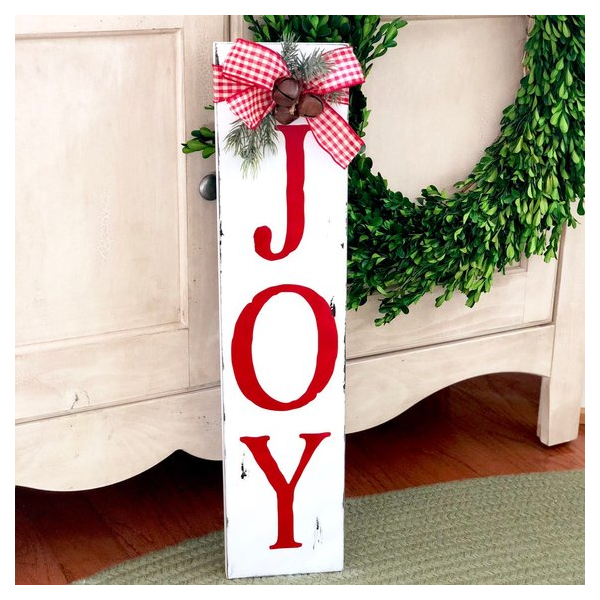 If your home has that cozy, country-classic style, a rustic wood sign would fit it perfectly. All you really need is some wood, stain (if you want), and paint. If you’re not keen on doing lettering freehand, check out this how-to video from Creative Ramblings on how to stencil a wood sign. 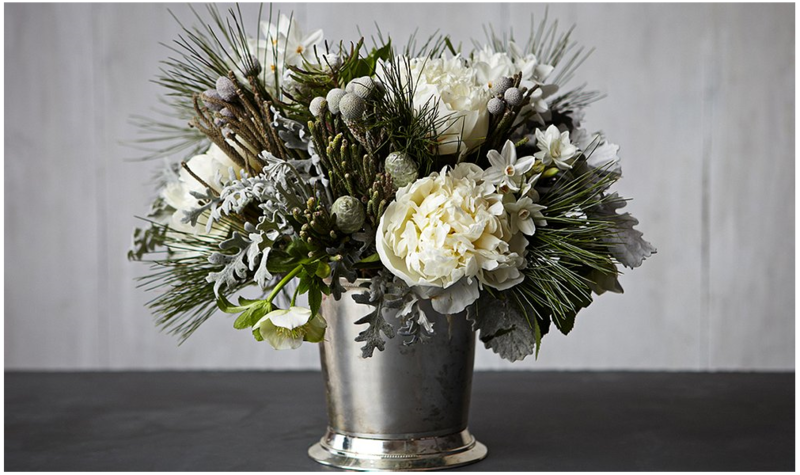 A quick Christmas flower arrangement not only makes for a great centerpiece to that Christmassy table we mentioned earlier, but it can dress up otherwise not-decorated parts of your home. I’m talking about that spare bedroom, the half bath… you know what those rooms are in your home. 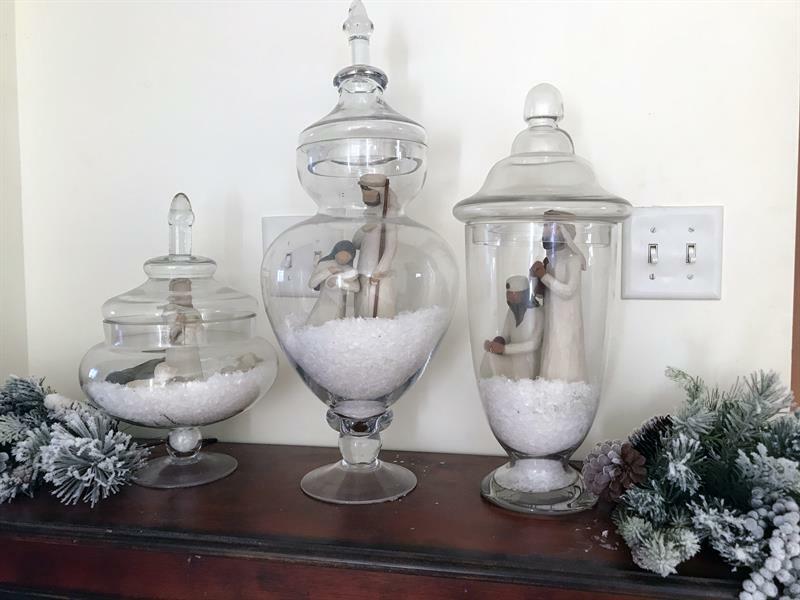 Use any old vase you have, and gather some tried-and-true Christmas pieces from a store like Hobby Lobby. Swapping out the pillows on your couch and your armchairs will make your home feel like a Christmas getaway. It does take a bit of commitment (and storage space), but it adds that festive touch that you can’t really get any other way. I mean, how else would you decorate your couch, ya know? 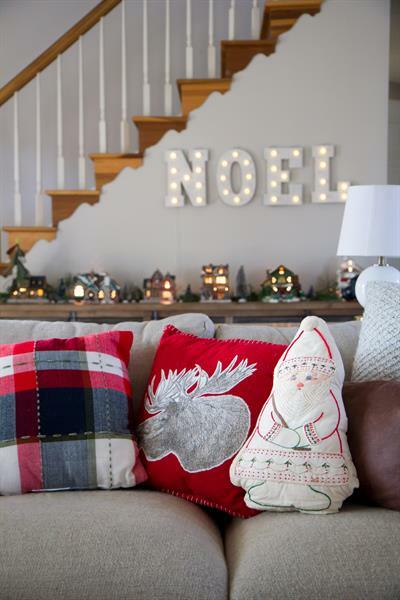 There are a lot of fun Christmas pillows out there in lots of shapes and sizes. Those chairs around your dining table and those barstools in your kitchen can be quickly dressed up to match the rest of your home. All it takes is some ribbon! Red, white, green, silver, gold – whatever color matches the rest of your decorations will go! Plus, you can swap it out each year to make your home interesting and unique each and every season. 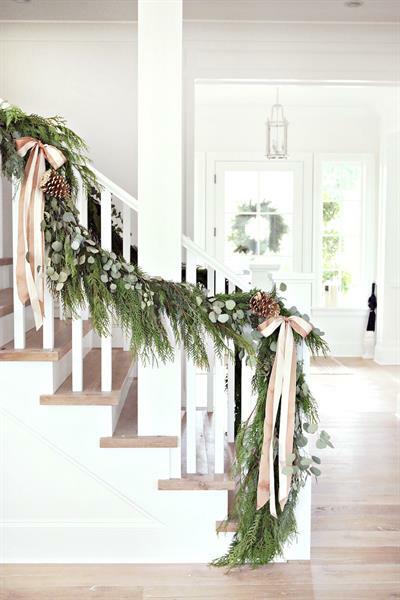 To add a little more festivity to the bow, you can slip in some pine or other Christmassy twigs. Easy, inexpensive, and impactful. OK, so this might be more of a craft than a decoration, but we had to include it. 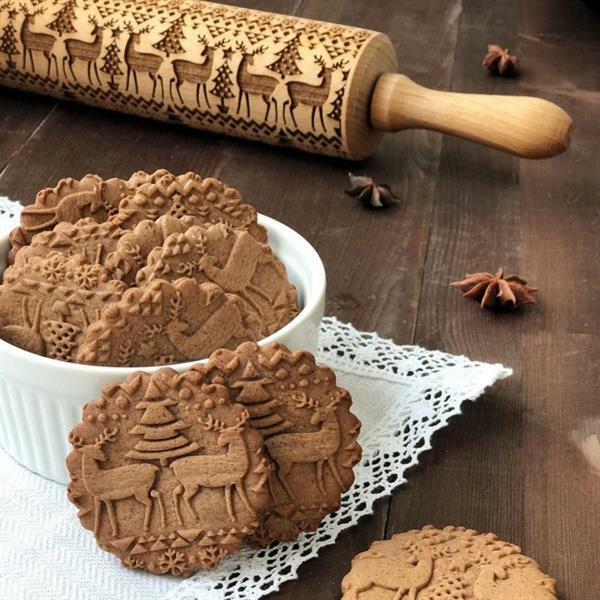 Decorating sugar cookies with the grandkids is always a blast, but check out these Christmas rolling pins! This is a fun way to add a yummy decoration to your kitchen display while guests are visiting. Just set aside some of that cookie dough and impress your family – tell them you designed these by hand and see what they say. 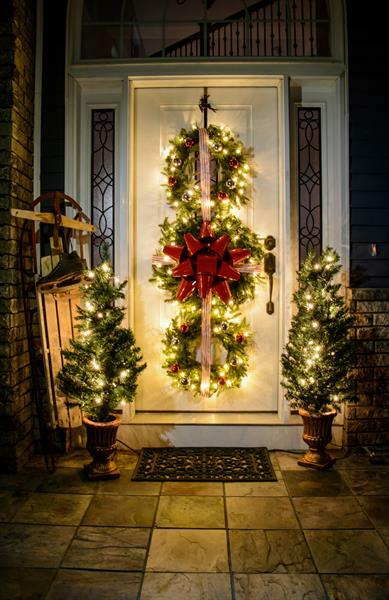 Yes, we know stringing up outdoor lights is a full-day event, but you can make a serious impact by giving your porch a little love. 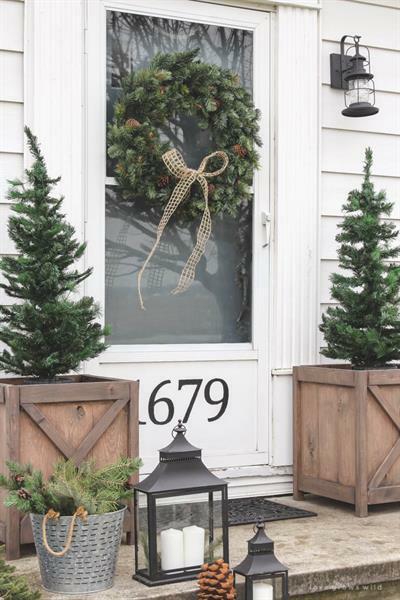 You can’t forget the classic wreath on the door or garland across the railings, but many people will decorate their pillars, add some small Christmas trees by the door, or Christmasify (yes, we’re coining that word) their existing plants or decor. Here’s some inspiration before we wrap this baby up (no pun intended)! There you have it! 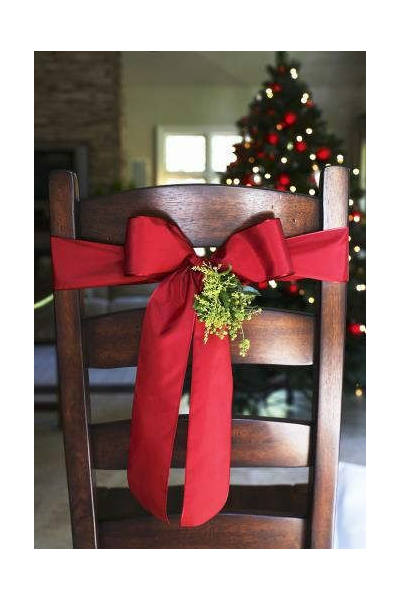 How are you decorating your home for Christmas this year? Let us know in the comment section! And don’t forget to share on Facebook – we’ll see you there! 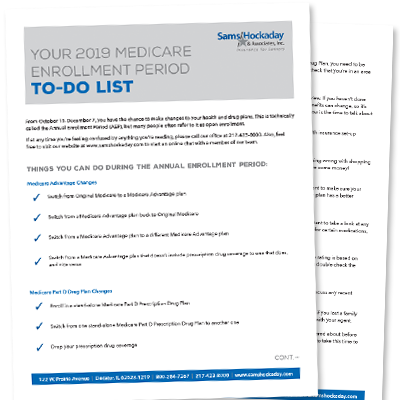 Sams/Hockaday & Associates are your local Medicare experts. We can help you choose the right healthcare plan, and we also specialize in growing your retirement savings. Contact us to talk to a licensed agent today. Agent Chase Gruening is very knowledgeable concerning insurance plans for seniors and is very willing to seek advise from his home office if something comes up that he's not sure of. 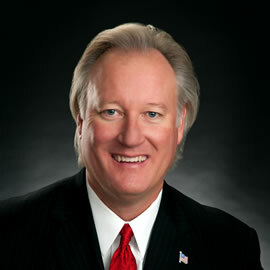 He is also very prompt and reliable concerning appointment times, phone calls, etc.